INDIVIDUA is a digitally planned treatment system for the indirect bonding of braces. Virtual planning of the bracket positions is performed in advance. Later, with the help of the innovative tray, the brackets are positioned quickly and accurately into the patient's mouth. In conventional orthodontic treatment, "fixed braces" are attached individually and, in most cases, manually to the patient's teeth without a pre-planned treatment goal. In doing so, the practitioner has to "work towards" a treatment goal that has not yet been specified. Thanks to the indirect bonding method with INDIVIDUA®, all brackets are glued in one sitting – with maximum digital precision and thoroughly taking into account the treatment goals. This ensures a significant optimisation of workflows and bonding time. Moreover, this method also ensures greater comfort for your patients. Thanks to INDIVIDUA®, the usual chair time of 40 minutes is reduced to 8 minutes. INDIVIDUA® FA BOND is a revolutionary, digitally planned treatment system for the indirect bonding of braces for the buccal treatment (facial axis/FA point) of children, adolescents and adults. On the basis of the FA point, virtual 3D planning for the accurate positioning of the individual brackets takes place in advance. Later, with the help of the innovative INDIVIDUA® tray, the brackets are positioned quickly and accurately into the patient's mouth. Only high-grade brackets are used for INDIVIDUA® FA BOND: you can choose from among brackets supplied by GC, Ormco or smile dental. This version for lingual application in the region of the front teeth is virtually invisible and therefore particularly suited for treating adult patients – specifically for cases involving indications that are hard to treat with aligners. 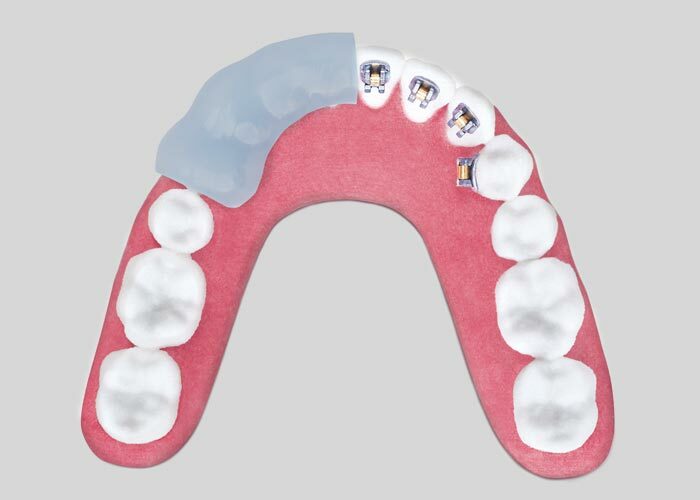 In addition to the INDIVIDUA® tray, the scope of delivery for the LINGUAL BOND version includes the 3D setup, the brackets and customised Nitinol wires. As part of the digital planning process, the high-grade mini lingual brackets are ideally positioned in the tray. This allows you to bond all the teeth in the initial situation in one single step. High-precision virtual planning facilitates the ideal positioning of the brackets – for buccal and lingual treatment. Every treatment runs exactly according to plan, thanks to the perfectly accurate positioning of the brackets. 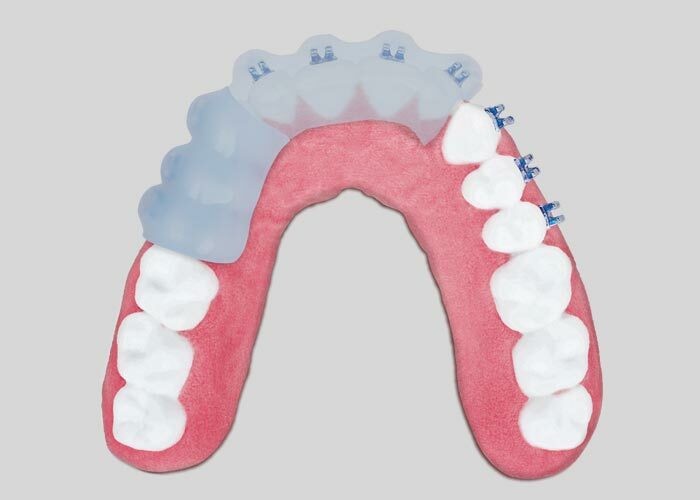 Bonding brackets with the INDIVIDUA® TRAY is much more convenient and easier than the manual procedure for attaching brackets. INDIVIDUA® is available as a segmented tray and can be re-used as a single-tray . It is available for buccal as well as lingual treatment. Available for buccal or lingual treatment. Delivered as multi segmented tray. Re-usable as single tray. No excess resin, no bracket loss, no re-bonding needed. ARE THE ARCHES INCLUDED IN THE SCOPE OF DELIVERY? Customers can use their own materials for all other INDIVIDUA products. CAN I ALSO WORK WITH CERAMIC BRACKETS? WITH WHICH BRACKETS CAN I WORK? ARE THE BRACKETS INCLUDED IN THE SCOPE OF DELIVERY? Yes, brackets are included in the scope of delivery for all INDIVIDUA Products. WHAT MATERIAL IS USED TO PRODUCE THE TRAYS? The tray is made of polyethylene that has been tested for biocompatibility in accordance with international standards ISO 10993 and EN ISO 7405 and approved for clinical use. WHAT IS THE PROPER WAY TO USE INDIVIDUA TRAYS?